A perusal of the various biographical sketches of the big pooh-bahs of Gilded Age Southern California reveals a surprising number of New England natives, and, in even greater numbers, those of the Cornbelt. Perhaps it was weevils, perhaps it was the dreadful weather or second-son status, but it seems that many an Iowa man came west in the years after the Civil War. For every rags-to-riches story is one of a man who came from relative privilege. Charles Oren Nourse was one of these. Charles O. Nourse's father Joseph Gabriel Nourse was born in Maryland of Colonial roots, moving first to Ohio, where his son was born at Rushville on February 12, 1853. After Joseph died in Cincinnati when Charles was 10, the family, perhaps led by Joseph's brother Charles Clinton Nourse, moved to Iowa. Uncle Charles was someone of great accomplishment, appearing as a man of honor in numerous biographical sketches, a noted orator and leading temperance advocate. He was Iowa Attorney General from 1861-1864 and later a distinguished judge. After reaching his majority, his namesake nephew prospered in the Hawkeye State, apparently dealing in real estate investments there. He married Iowan Miss Elizabeth Christ in 1886 and had two children—Paul in 1888, himself to become a judge who was later to live at #9 Berkeley Square, and Virginia a year later. Charles appears to have left Des Moines permanently for California in 1902 for reasons of health. Around the same time, his first cousin Clinton Charles Nourse, Charles Clinton's son and an established Des Moines architect, came west for a visit that set off his own dreams of sunnier climes. C.O. opened his real estate investment business in Los Angeles, and, with his considerable experience, quickly became successful in his new hometown. Charles and Lizzie seem to have arrived in Los Angeles with not only a few shekels, but with letters of introduction to all the right people. 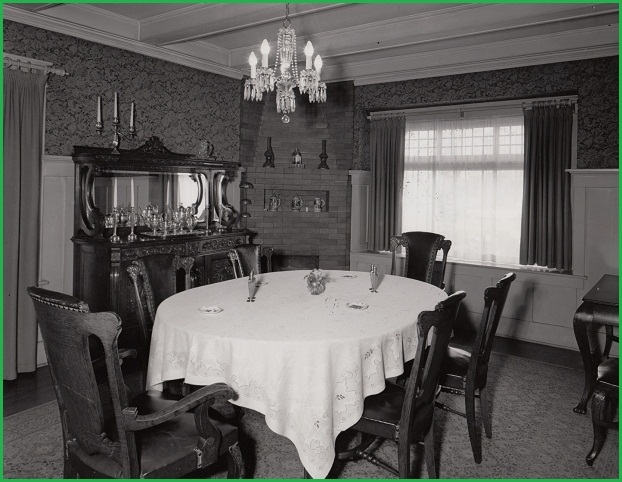 Mrs. Nourse, for her part, was taken into the Ebell, Friday Morning, and Three Arts clubs, enduring for years ladylike card parties and all sorts of lectures on arcane but genteel subjects. 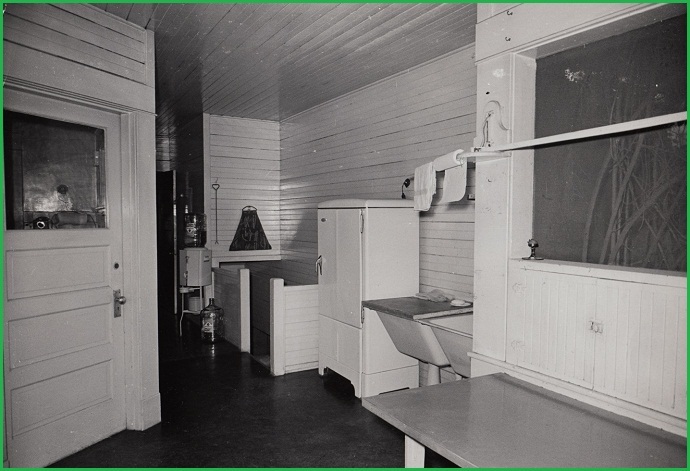 Midway upon the road of life and sufficiently reinvigorated by their new surroundings and society, the Nourses even undertook the building of a new home, one appropriate to their station. 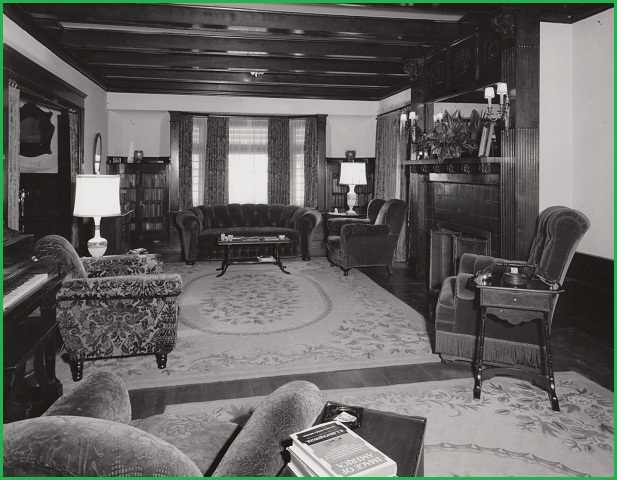 Charles may have met William R. Burke through real estate dealings; at any rate he became one of the first to buy in Burke's new Berkeley Square subdivision when he purchased Lot 21 toward the end of 1905. By the following April Charles had taken out a building permit for a two-story, eleven-room residence on which he intended to spend $9,200. No architect has been found, but of course one wonders if cousin Clinton was consulted, though it wasn't until later in the decade that the architect moved from Iowa to settle permanently in California, living in Sierra Madre and setting up his architecture practice in downtown Los Angeles. The builder of the Nourse's new house on Lot 21 was A.W. Moore. It was the second to be completed in the Square and would be numbered #16 after 1912.
time this scene would run in reverse in 1963. 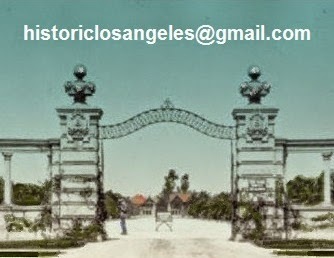 The four Charles Oren Nourses moved into the new house toward the end of 1906; Paul finished at Los Angeles High School two years later and went on to U.S.C. for both his undergraduate and law degrees, perhaps bicycling to campus from home for the duration. When C.O. reincorporated Nourse & Company in January 1914, he included as partners both Elizabeth and Paul in the $250,000 capitalization. Later in the year Paul represented his father in a dispute with the Los Angeles Board of Public Service Commissioners. It seems that Charles had acquired a property with an outstanding water bill of $1.50—about $33 today—which he refused to pay on principle. The case was eventually taken by the Nourses to the state Supreme Court and won. Even with Paul's freebie legal services, it seems like an awful lot of bother over $1.50. But C.O. sounds like he was the sort of man to whom pursuing things down to the last penny constituted the highest form of pleasure. In other family doings, Judge Charles Clinton Nourse arrived from Iowa to spend his last years with his son Clinton Charles among the orange groves of Sierra Madre. (He died there in 1916; his Los Angeles Times obituary refers to both son and nephew.) A few years after time spent studying music and painting in Paris, Virginia Nourse bagged a big one when she became engaged to Louis Cass, Stanford football star and one of 12 children of Los Angeles business dynamo Alonzo Beecher Cass. After many entertainments, "complimentary to"—as the papers put it—the young couple, including one offered by the Robert McReynolds who lived next door to the Nourses on the Square, Virginia and Louis were married on November 4, 1914. Apparently intended as a wedding present for the newlyweds, C.O. 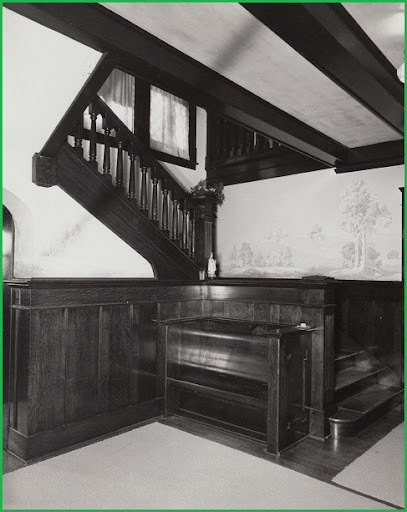 had begun building a Colonial house at 2531 12th Avenue two months before—cousin Clinton, now living in Los Angeles and actively designing in the city, is known to have done the design (as well as one for Frank Horne that can still be seen at 119 Fremont Place). Less than a month after the Cass wedding, Paul married one of his sister's bridesmaids, Miss Margaret Leigh Ericson, on December 1. 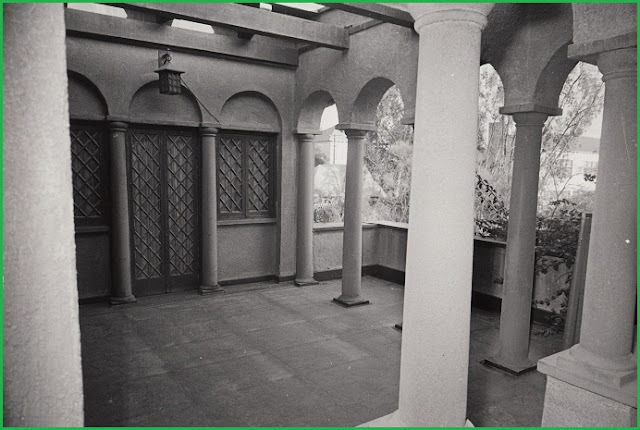 In another architectural side note, the Casses were to settle in Flintridge by 1921, and, again overlooking cousin Clinton, chose newly minted architect Paul Williams to draw their house there. While Williams wasn't asked to design any houses on Berkeley Square, it's good to know that a child of the street gave him an early boost and we may be thankful as well that none of his creations were lost in its bulldozing. It was steady as she goes for the equable Nourses at #16 for nearly 50 years. Sober and steady youth were reared, proper marriages made, no messy divorces, maybe a little wine, but no Hazel Glabs. Charles no doubt had exactly the same breakfast every morning before driving down to his office and examining the day's receipts down to the last $1.50. Home to the Square for dinner, lamb chops and white rice. C.O. seems to have preferred lodge meetings of the Masons to more exclusive clubs, which is not to say that he wasn't mindful of his family tree, shaking it for all its worth. While striving upper-middle-class Americans have always somehow managed to find or create family crests and root out royal or at least titled English forebears, C.O., while claiming a baronet somewhere in the mix, seemed prouder of the less foreign connection to McKinley's Secretary of State John Hay and Joseph Nourse, first registrar of the U.S. Treasury, among one or two other high-toned American eminences. All in all, the Nourses seem to have been a Grant Wood couple, living higher on the hog but not given to throwing the epic at-home entertainments common in other households on the Square. The most exciting thing to happen at #16 appears to have been the 1924 visit by yeggmen who made off with $300 worth of jewelry, clothing, and...wine. (Don't tell Uncle Charles—perhaps #16 was a bit less sober of a household than one might imagine when reading about C.O. and Lizzie.) While C.O. 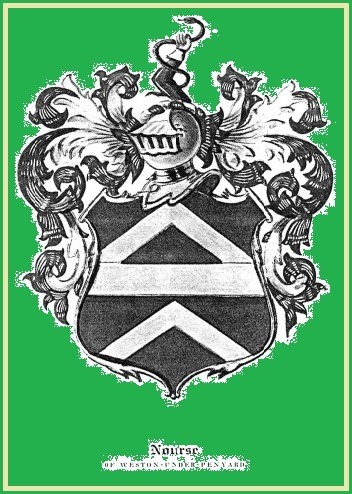 kept regular hours downtown until his death, he did take the time to travel to England late in life in search of his roots in Herefordshire—is there any doubt that the family crest was displayed on the wall of #16? C.O. 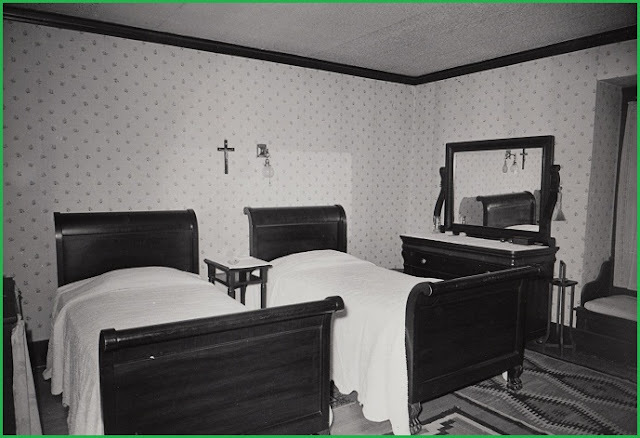 was called by death at home on August 3, 1936, age 83. 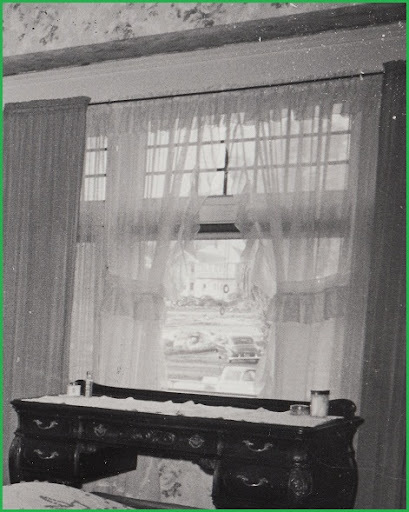 Perhaps after his root-finding trip it was he who specified the Wee Kirk o' the Heather chapel at Forest Lawn, even if more Scots than English, from which to be buried. Elizabeth Nourse stayed on at #16 until the moment she died on February 10, 1951, age 86. It appears that son Paul Nourse, who in 1928 had moved into #9 across the Square, sold both his parents' and his own house there sometime before 1955. Edward B. Murray was Frederick Swensen's brother-in-law. 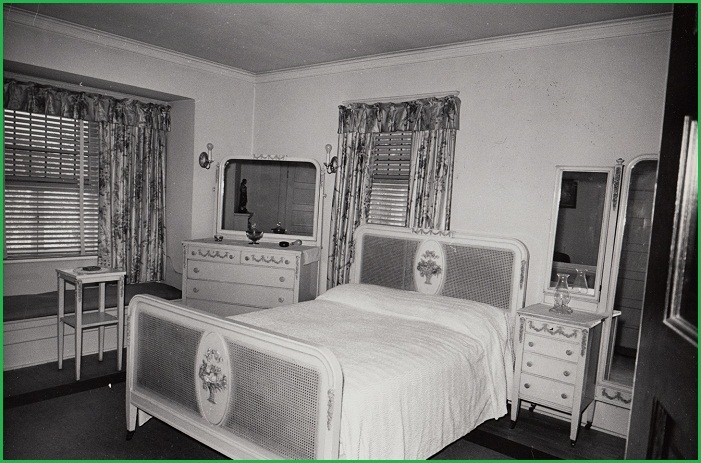 The next tenants were that rare breed: native Angelenos. 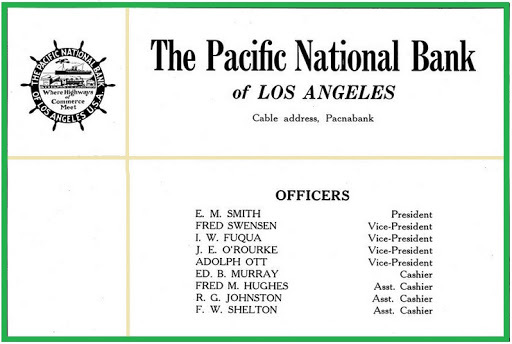 Anthony Frederick Swensen, born on Columbus Day 1890, would have been familiar with Berkeley Square through his life as a banker, particularly in his associations at the Pacific National Bank with E. M. Smith of #33. 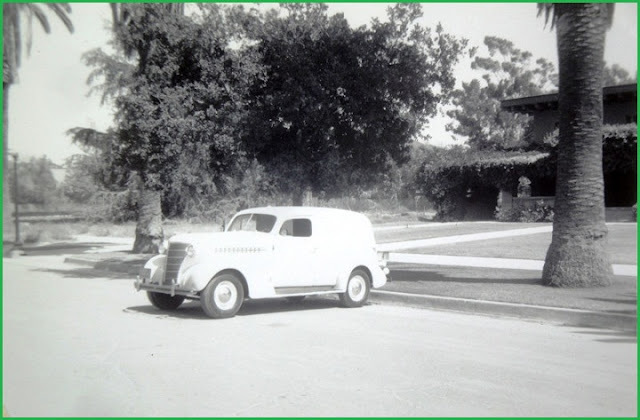 Swensen began as a bookkeeper for the Hibernian Savings Bank, living in the 1910s with his mother at 4360 South Figueroa. 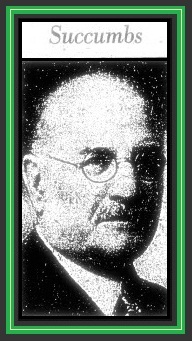 His rise was swift; by 1923 he was assistant cashier—not to be confused with a teller—at the California Bank. That same year, he became a founder and first vice-president of the Pacific National Bank and vice-president of the associated Florence National Bank. 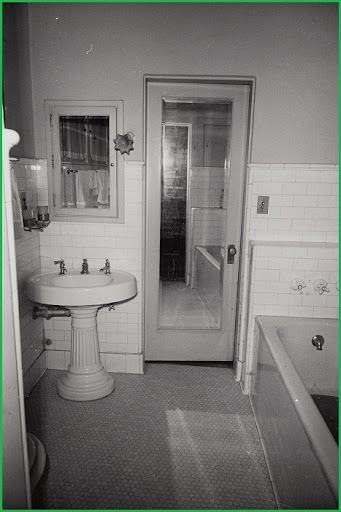 By 1929 he was executive vice-president of Pacific National and was married to Helen Murray, who had been born in Los Angeles on November 1, 1900, and had a son; the couple lived at 618 South Van Ness before moving to her parents' house at 686 South Carondelet by the end of the '20s. It could be that the Depression altered the course of Fred's career, as there seems to be little evidence of his business life in city directories or elsewhere during the '30s. He and Helen were involved in a lawsuit brought by injured neighbors in 1931 after an abandoned Julian oil well exploded on property the Swensens owned in the Athens district of South Los Angeles. The defense pleaded an Act of God; the outcome is unclear. To add to their woes, in 1933 there was a foreclosure on property at the prime downtown corner of Olive and 8th that Helen's family had owned for decades, and while a second son, Milo, was born in 1933, a daughter born two years later, Nancy Patricia, died as a baby. 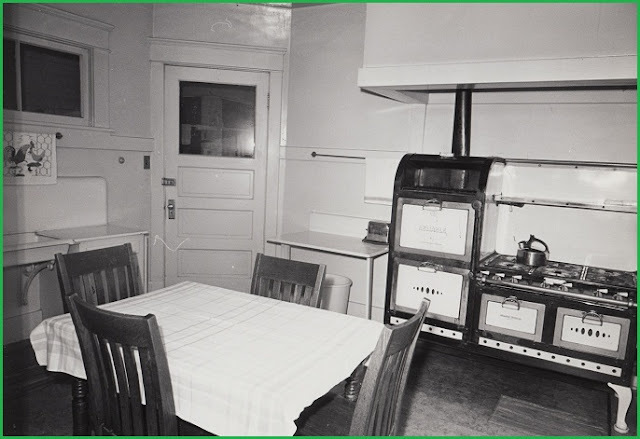 Perhaps seeking to recoup memories of the fat years, and now that Berkeley Square was fraying and becoming more affordable, the Swensens bought #16 from the Nourses and were in residence by 1952, the ultimate fate of the Square not yet fully understood by residents or city planners. It was probably a blow for them to realize a few years later that the street was to be decimated by the new Santa Monica Freeway, but they held on to the bitter end, listed in the last city directory to note #16, that of 1963. Windsor Square boy Don Young, the godson of Helen Swensen's sister—Mrs. George A. J. Howard of 601 South Windsor Boulevard—remembers riding his bicycle down to the Square to see the sad spectacle of #16 being demolished. The Swensens moved out of Los Angeles proper after the demise of the Square, though Helen died in the city on February 21, 1967. Fred died at Palos Verdes on February 11, 1971. The Swensens, it should be noted, did not leave Berkeley Square without a fight. While the condemnation of the street was a foregone conclusion by 1962, what constituted proper compensation for the house in eminent domain proceedings was not quite settled. It seems that several Square homeowners, represented by attorney Arthur Garrett, who appears to have recently been living at #17, fought for a better price. It was Milo Swensen who went to bat for his parents. 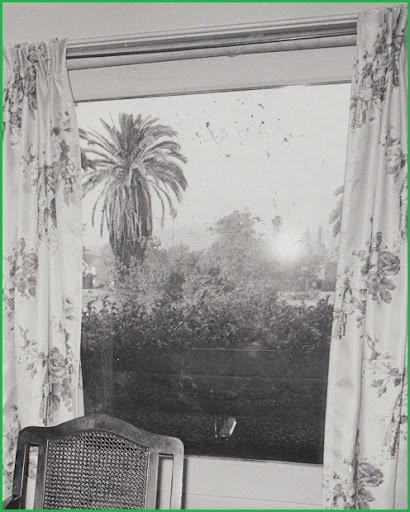 A series of photographs of #16 were made in late 1961/early 1962, judging by the issues of Newsweek and National Geographic on the coffee table, perhaps in preparation for the lawsuit or perhaps just as a keepsake; it is the largest known group of Berkeley Square still-lifes, all the more poignant in their 11th-hour timing. 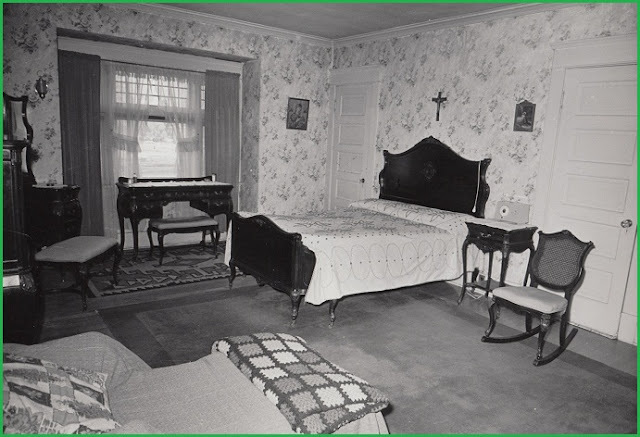 The house appears to be untouched from its construction 56 years before, with period fixtures and furnishings; certainly one wonders, from this point in time, how the pictures could possibly have helped the case for a higher valuation. 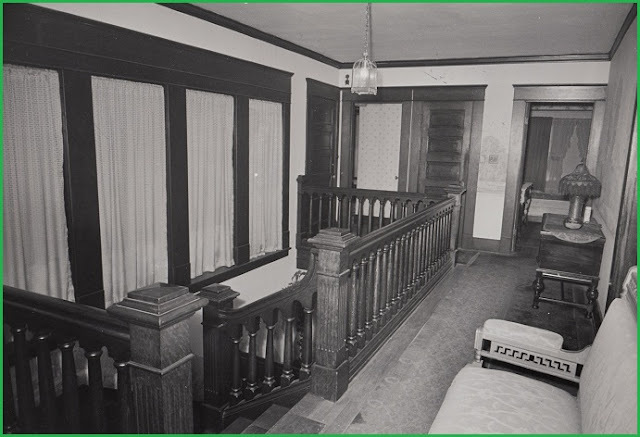 At any rate, it is apparent that this was a house typical of old Los Angeles—one whose architecture was designed for the comfort of Midwesterners and Easterners used to burrowing in for the winter. 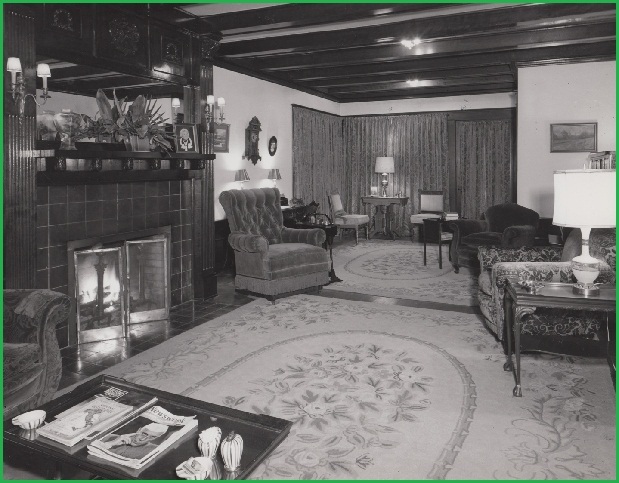 In addition to the economic and demographic factors that drove West Adamsites away, there was the postwar discovery of California sun and air and light by the descendants of the immigrants, a final rejection of Victorian architectural gloom and its dark and wooly interiors. Below, a tour of #16 Berkeley Square, frozen in its last hours. the south side of Berkeley Square. were intended to be the domain of servants. sun setting on palm-lined, once-Edenic Berkeley Square. sleep on October 7, 2015.